This morning, in New York City, Verizon and Motorola announced the release of the new Droid devices, yes, “devices”, as in plural. The Droid Turbo 2 and the Droid Maxx 2. It was a small gathering, no flashy cinema, no extravagant dancers or sing-along songs. Just 3 or 4 executives giving us the download on this new phones. Short and Sweet! The first announcement was the Droid Turbo 2, which looks an awful lot like the Moto X Force which won’t be released in the US. 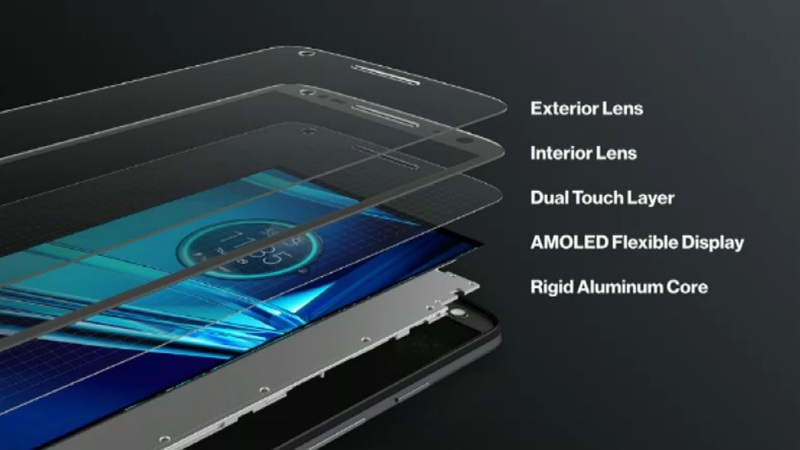 The #DT2 will sport a 5.4″, QHD, shatterproof display, a Snapdragon 810 processor, 21 MP camera, and a 3760 mAh battery. Also, it will be the first Droid available on Motorola’s MotoMaker website which allows you to customize the look and feel of the device with options of multiple colors as well as textures: Horween leather, Silicon, or Ballistic Nylon. Lastly, it sports Motorola’s TurboPower charging capability which provides 13 hours of additional battery life in 15 minutes of charging. The second announcement was the Droid Maxx 2: Maxx Battery, Maxx Megapixels, and Maxx Value. This phone is like the Moto X Play which is the international variant that is not available in the US. The #DM2 will sport a 5.5″ QHD, shatterproof display, a Snapdragon 615 processor, 21 MP camera, and a 3630 mAh battery. Droid Maxx 2 will not be available to customize via MotoMaker, but they are selling swappable backs and flip covers in multiple colors. Droid Maxx 2 is also capable of TurboPower charging which gives you 8 additional hours of use in 15 minutes of charging. These devices are similar in many ways, one most notably important is the shatterproof screen using ShatterShield technology. This is Motorola’s exclusive technology which uses 5 distinct layers to provide an solution to the problem everyone is worried about, breaking their screen. The five layers are a rigid aluminum core, AMOLED flexible display, dual touch layer, interior lens, and an exterior lens. The sum of the parts creates a disturbing, live in person, drop test which happened at least two times on stage during the event. and the screen survived each time. While the phones seem stunning, the pricing is underwhelming. They didn’t come straight out and tell us how much each phone will cost. Instead, because Verizon is moving towards payment plans, they told us how much it would cost each month (assumed 2 years payment plans). 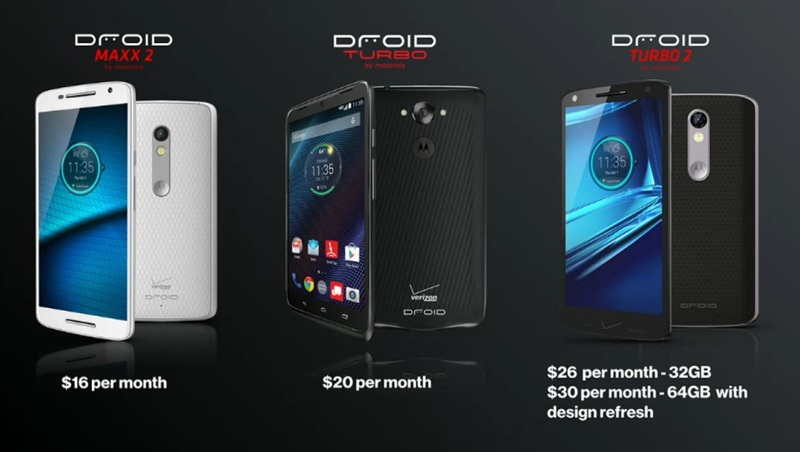 The Droid Maxx 2 will be $16 per month, The original Droid will go to $20 per month, and the Droid Turbo 2 will be $26 and $30 per month for the 32GB and 64GB respectively. Don’t forget that you can trade in your old smartphone towards some cash on the new Droids. They’ll even accept broken displays this year. So what is there to think of these new Droids? Are they the Droids we’ve all be waiting for? Leave your comments below and let me know if you plan to pick on up.